School budgets in Wales are at breaking point: education funding is being stretched, schools are suffering with fewer teachers and support staff and class sizes are increasing. The Welsh government education budget has decreased by 2.37% and more cuts to LA funds are bypassing the so-called ‘protection’ for schools. Wales needs sufficient, equitable and transparent school funding. 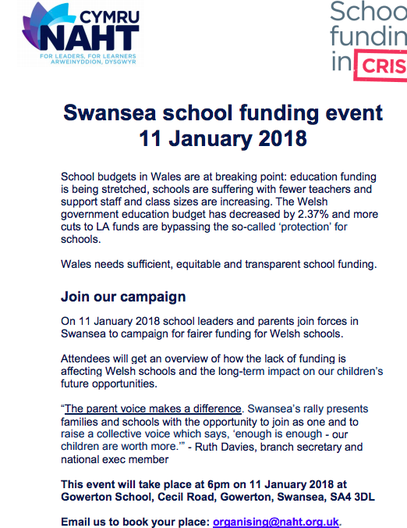 Join our campaign On 11 January 2018 school leaders and parents join forces in Swansea to campaign for fairer funding for Welsh schools. Attendees will get an overview of how the lack of funding is affecting Welsh schools and the long-term impact on our children’s future opportunities. “The parent voice makes a difference. Swansea’s rally presents families and schools with the opportunity to join as one and to raise a collective voice which says, ‘enough is enough - our children are worth more.’” - Ruth Davies, branch secretary and national exec member. This event will take place at 6pm on 11 January 2018 at Gowerton School, Cecil Road, Gowerton, Swansea, SA4 3DL Email us to book your place: organising@naht.org.uk.